When we decided to spend this extra year in the South Pacific, we wanted to find the quiet places similar to the Tuamotus group of French Polynesia, where we were for two weeks in 2016. Two of the main island groups we missed that are less-traveled are the Ha’apai group of Tonga and the Lau group of Fiji. We’ve been in the Ha’apai group for 3 weeks now, and it is EXACTLY the kind of place we wanted to spend time in. Watch the Video: We Witnessed the First Breaths of a Humpback Calf! 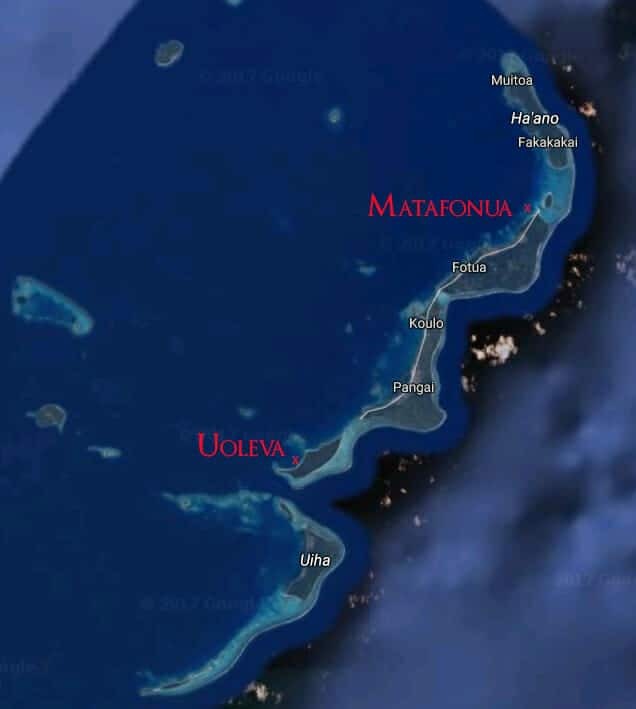 There are five island divisions in Tonga (in order of population size); Tongatapu, Vava’u, Ha’apai, ‘Eua, and Ongo Niua. 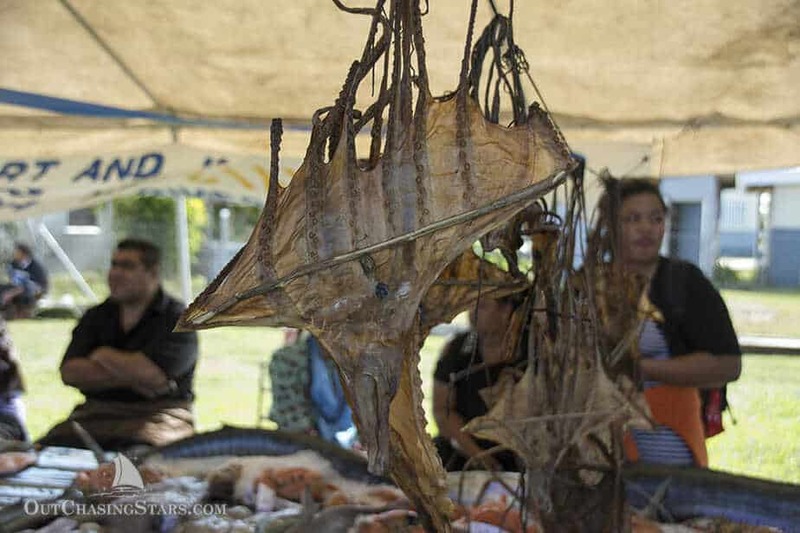 The Ha’apai group has 51 islands, but only 17 of them are populated by the 7,212 inhabitants. 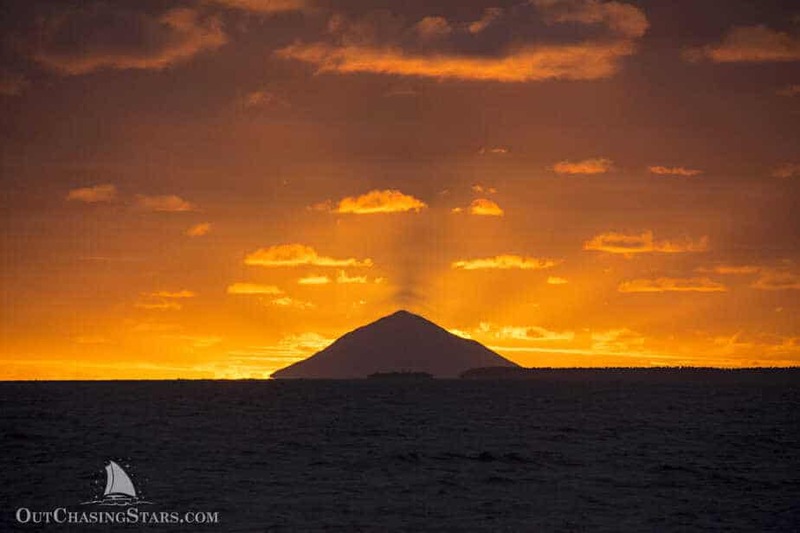 Ha’apai also has the tallest peak of Tonga, the Kao volcano, a dormant volcano standing at 3,432 ft. Tofua, next to Kao, is an active volcano. The volcanoes are a rarity though; most of the islands are small coral atolls or reefs. Tofua is also the site of the mutiny on the HMS Bounty. The mutineers set Bligh and 18 other seamen adrift in a launch from the Bounty. They immediately landed on Tofua, 30 nm away. However, trouble with the locals led to the death of one crew member. Bligh led the remaining men on a 3,500 nm passage in the small launch to Timor. They bypassed other lands where natives were rumored to be hostile. Although I know there are divisions of the islands of the Ha’apai into groups, I’m not finding a map or detailed explanation of the groups. I’m going to assume that we’ve been spending our time in the Lifuka group of the Ha’apai, named after the main island where the village of Pangai is located. 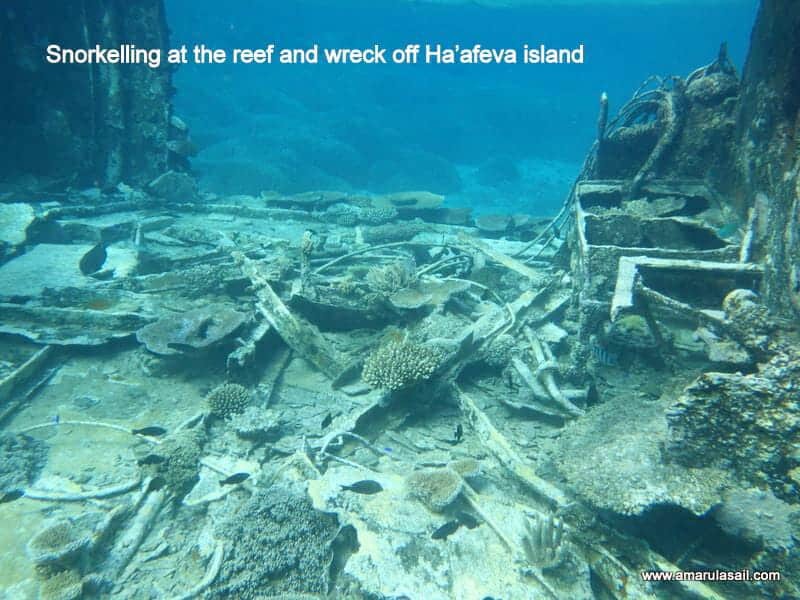 There are three large barrier reefs in the Lifuka group on the eastern side of the islands. 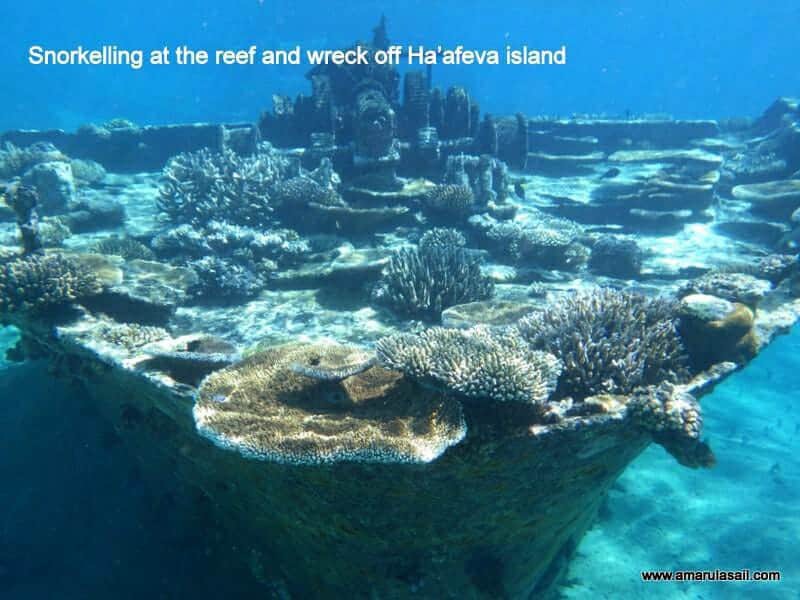 These reefs protect the islands from the typical ocean swells, and the anchorages are on the west sides of the islands. 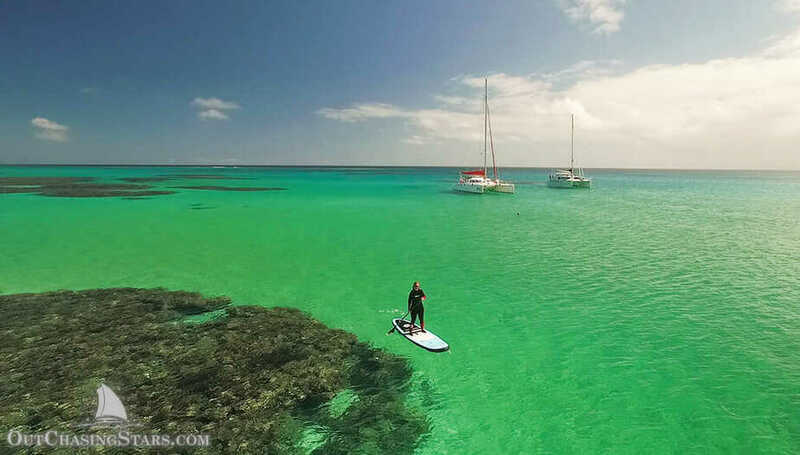 At low tide, the barrier reefs block almost all the swell, so the east side of the island become almost pond-like. 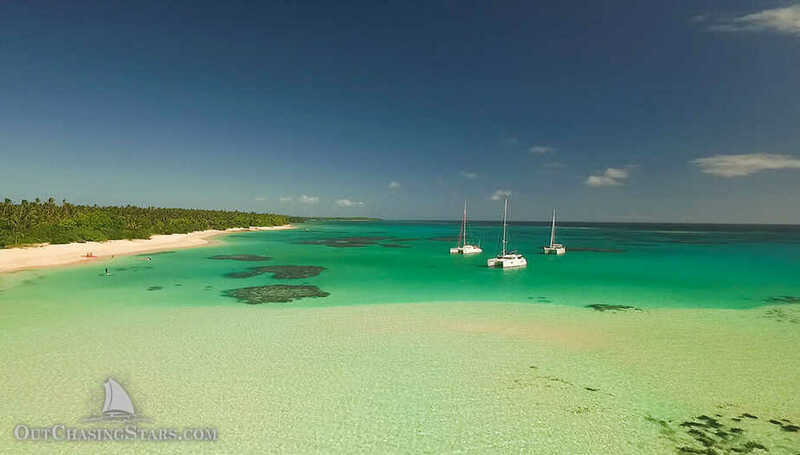 Our first stop in the Ha’apai was the north side of Foa Island, where we anchored off Matafonua Lodge for eight days. The bottom is spotted with bommies (coral heads), but our friends on Whistler were already anchored in one of the larger sandy patches. With us and Tika joining, it was crowded. There’s barely enough room for three catamarans, and with the wind shifting, we picked up and reset once, and so did Tika. 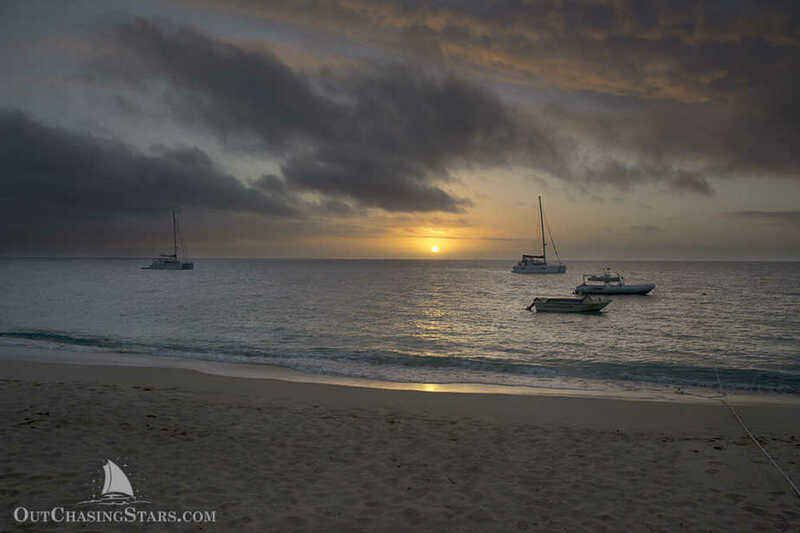 Three catamarans, snuggled up at Matafonua. Matafonua Lodge is owned by Darren and Nina, they also recently bought Sandy Beach Resort just 300 meters down the beach. Everyone was very welcoming to us cruisers. We had pizza for lunch one day at Matafonua, which was so, so good! Then we had dinner one night at Sandy Beach Resort, which is upscale dining. I had duck breast and David had lobster risotto, plus four drinks and sides, our meal came to $120 TOP (roughly $50 USD). Pretty nice for a swanky meal and stunning sunset view. Most of our time there was very windy. The islands are great for blocking eastern swell, but because they are low sandy islands they do not stop the winds. Winds around 20 knots are great for our friends who wanted to get out and play in the wind. Monty from Whistler kiteboarded most days, and the whole crew of Tika was often out windsurfing all day. Whistler let me borrow their Kahuna paddleboard (a Canadian brand) to practice on, and I’m thinking about buying a paddleboard soon. David and I even tested it up on the davits to see if it would fit with our flag and grill on the stern rail (it does). Out on Whistler’s Kahuna paddleboard. We made a few snorkeling trips too. There was a large mostly-alive bommie right behind us. I went snorkeling by myself and saw large bluefin trevally, two peppered morays (I think) and large schools of unicorn fish. I took David once and of course, we didn’t see the eels or the trevally. On July 20th all 8 of us gathered to snorkel the pass between Foa and Nukunamo island. 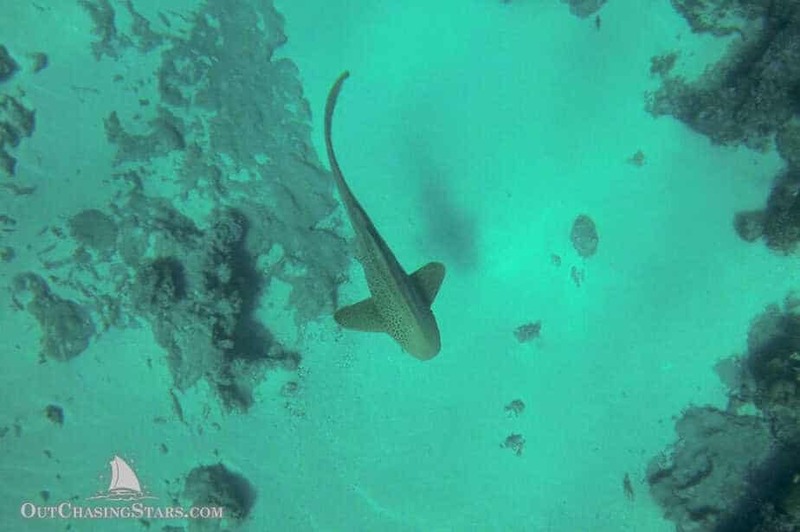 The big draw is zebra sharks, of which we spotted two. Often called leopard sharks (though leopard sharks are a different species), zebra sharks are named for the black and white pattern they have when they are babies. Zebra sharks are bottom-dwellers. The ones we saw sat at the bottom at roughly 25 feet for quite some time until we got too close. One swam for a while with most of us tagging behind watching. The coral was good as well, though the ratio of live-to-dead was not very high. Four of us (me, Greer, Monty and Margy) took one dinghy up to Nukunamo’s northwest shore and snorkeled again. The water here was shallower, no more than 15′ and the bommies were large. Some had much higher live-to-dead ratios, and the coral was frequently in bright purple and greens. We saw lots of anemones and the inhabitants (anemonefish aka Nemos). I even got a clear night to shoot some stars! Little Dipper under the Milky Way. Finally, it wouldn’t be Tonga without more whale sightings. One morning I was cooking bacon and on the transom dumping out the grease. Margy called over to tease us about the bacon smell. I looked up and behind Whistler was a giant splash! Sure enough, we watched several whales breach over and over again. 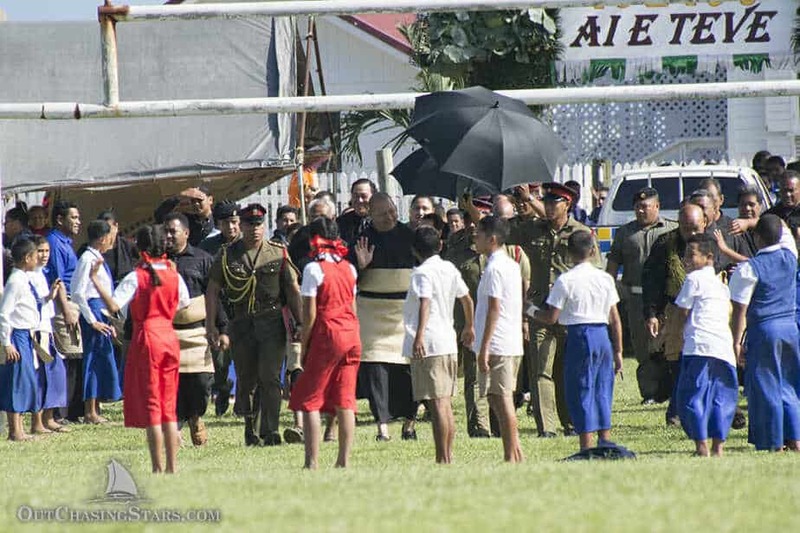 The King of Tonga makes a yearly visit to the islands. His visit to Vava’u coincided with ours, but we skipped town to avoid the heavy crowds. 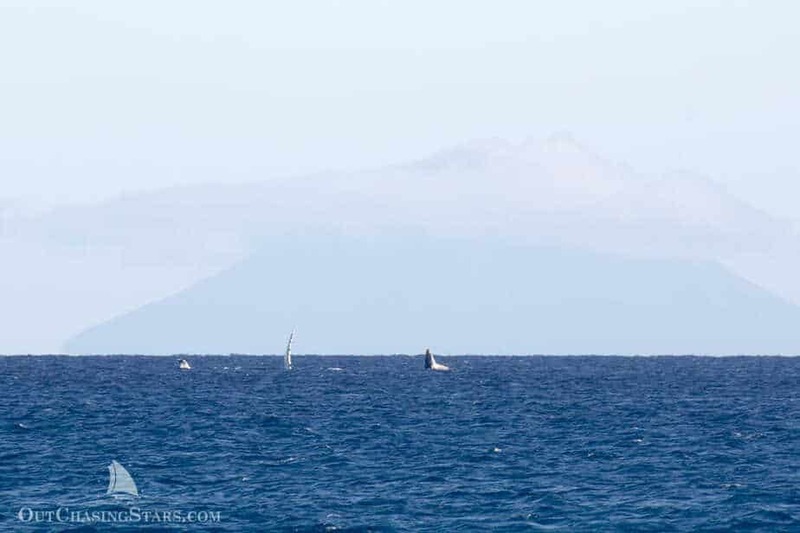 However, we were anchored off Matafonua when he came to Pangai. The resort had a few trucks going to the Agricultural and Fisheries Show, so we decided to hop into town and check it out. Margy came with us, and we hopped off the truck early. We stopped into the customs office so we could report our inner-Tonga movement to the Ha’apai group and give them a form from the Neiafu Customs agents. 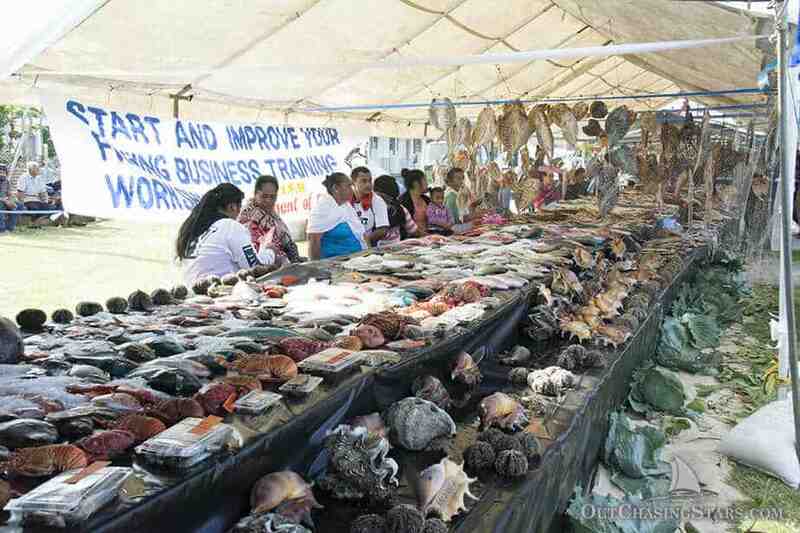 We walked to the fairgrounds where vendors were lined up, showing off their produce, fish catches, or handicrafts. Mostly the crowd was locals, but handfuls of tourists and cruisers were milling about too. The produce was in baskets or hung, with (I’m assuming) the name of the village or farm nearby. The fisheries tent was definitely the most interesting. The vendors aren’t allowed to sell their items until the end of the show but you have to stake a claim to things early to get anything. We walked away with oranges and red peppers (note that I couldn’t even find red peppers in Neiafu). Small nurse shark I think. No idea what these fish are, but I would imagine their bellies puff up. 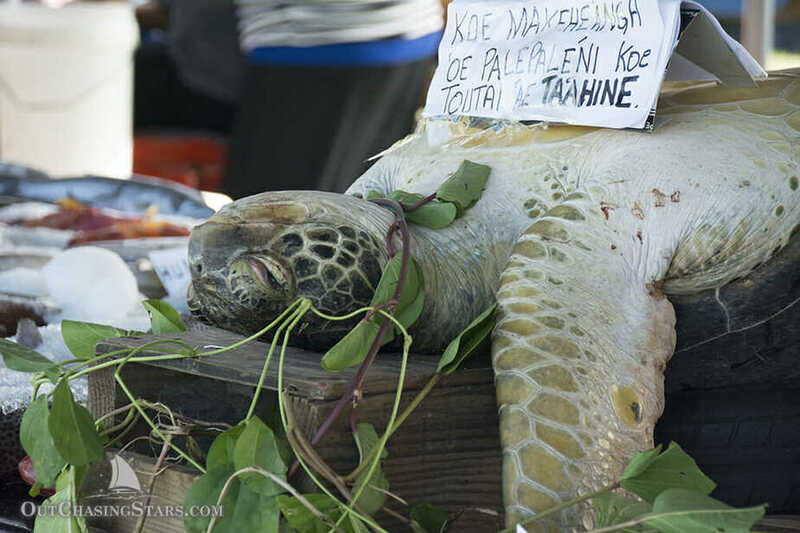 Sadly, this turtle was still alive. We almost got to the end of the booths when we were told to take a seat because the king was coming in. Kids lined up the path to wave and cheer, matrons danced, and a marching band played. The king waved from under his umbrella and then the speeches commenced and the three of us snuck out to town. Margy showed us around to the harbor, where we will have to come to clear out of Tonga. There are two Chinese grocery stores in Pangai, with limited perishables, but a pretty good variety of dry goods. I bought mayonnaise and Margy bought double stuffed Oreos! We got back to the fair just as HRH was starting to tour the booths. Once he was done touring, everyone took a seat again and then the tau’olunga (traditional dancing) started up. We didn’t catch all of it because we had to get our ride back, but the girls in traditional costumes were milling about for a while and happily posed for pictures. 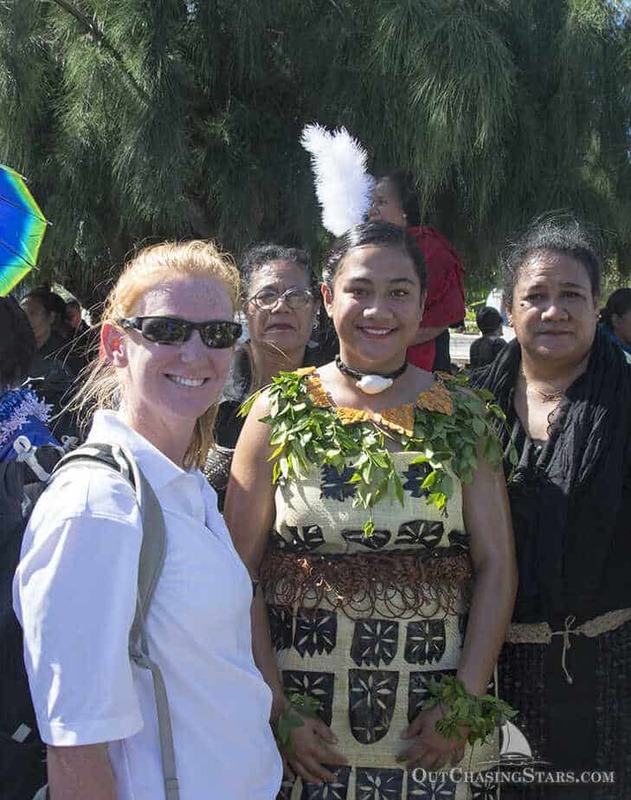 I was glad to see that the costumes and dancing were very similar to what we’ve seen at the “touristy” places (like My Tongan Home and Oholei Beach), so I feel that the authenticity is pretty accurate. The king waving to the school kids. The people watching was fantastic. Yes, many people (especially youths) dress in a western style attire (jeans and t-shirts) but many people still wear traditional day wear and formal wear. Men wear tupenu (Tongan sarong or kilt), long sleeve button up shirts, and a taʻovala (woven mat) with a belt. They may also wear a tie and jacket with this outfit to make it more formal and modern. 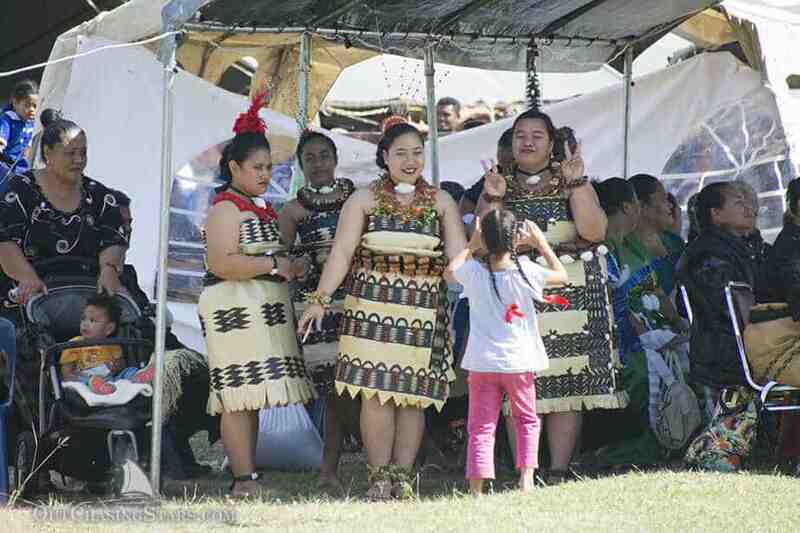 Ladies typically wear long dresses or skirts with sleeves to their elbows and ta’ovala or kiekie (belts with long dangling decor) tied around their waists. 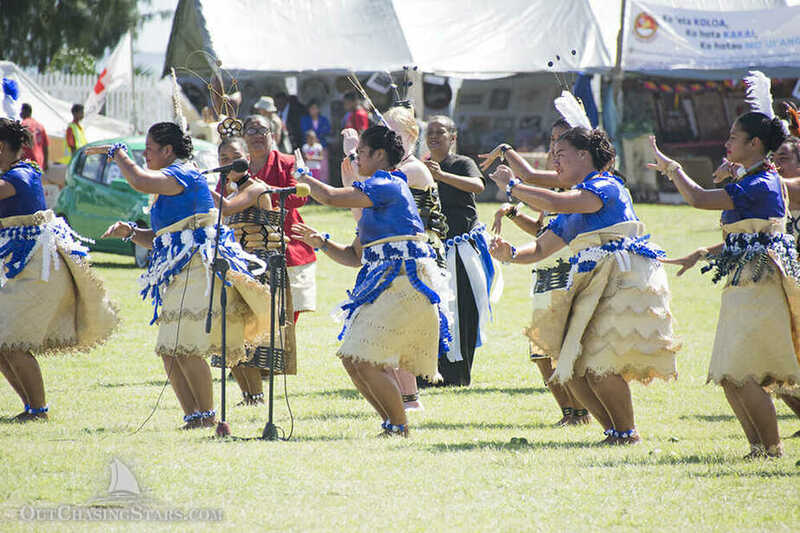 The really traditional wear that the dancers had on is a wrap dress, made from ngatu (tree bark) and decorated with flowers, shells, or leaves. 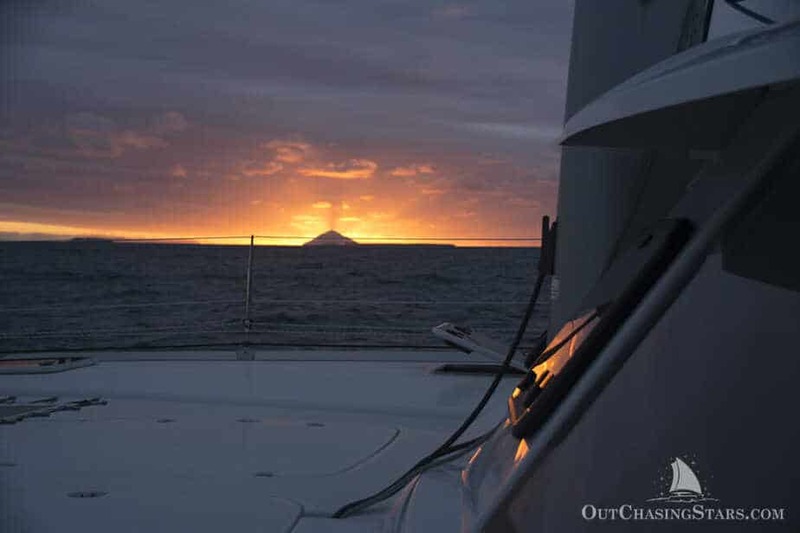 Uoleva is a big wide anchorage, with reefs extending out from both ends of the island to a C-shape bay. 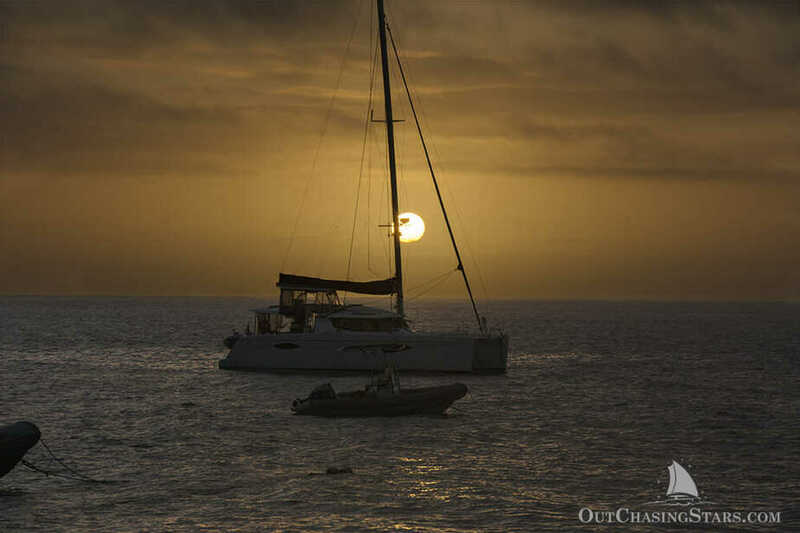 There are three resorts, and we anchored off Sea Change Eco Retreat. The staff was welcoming and we had drinks at the bar a few times. We went snorkeling on the reef on the south end of the island, on the inside of the reef (not out in the pass). There was nothing too spectacular to report about. 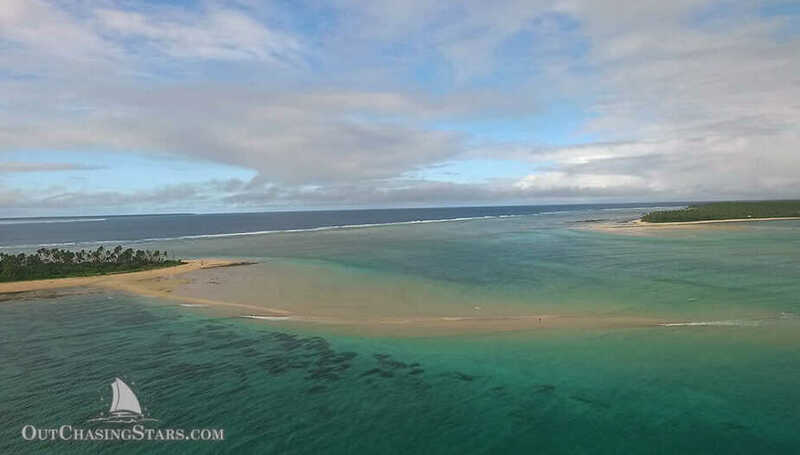 The highlight of Uoleva was walking from Sea Change around the southern point of the island at low tide. The walk took us about three hours, and once on the other side, there is a walking path to shortcut the island in half. That short cut is about 20 minutes. The view all around the walk was gorgeous, with the electric blues and sea greens inside the reef, to the deep blues of the pass between the reefs. 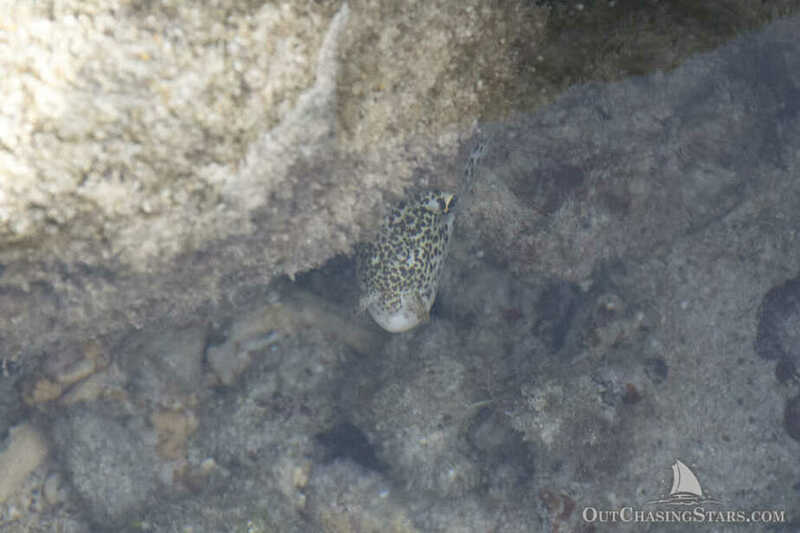 A highlight was seeing an eel swimming in the shallows with a crab snack in its jaws! I woke up at 2 am for this shot! Sunset behind Starry Horizons and Whistler. 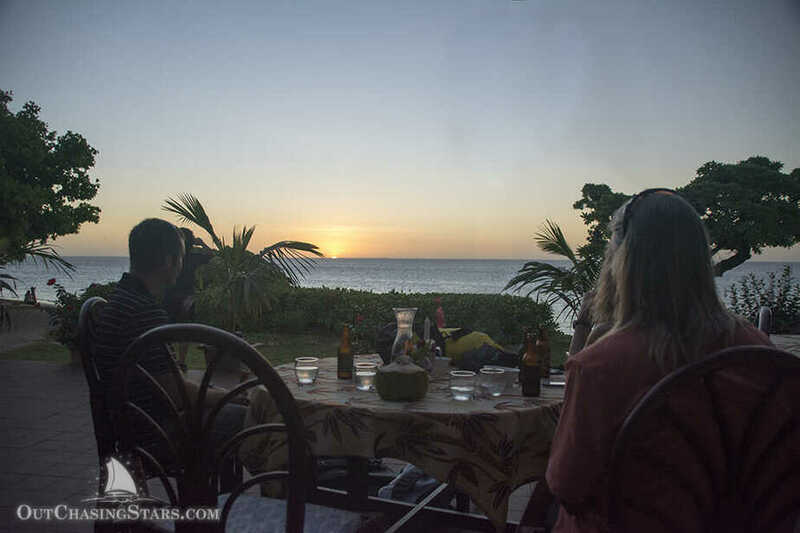 Sunset and Starry Horizons from Sea Change Resort. The view of Uoleva from Starry Horizons. The beach on the far side of Uoleva. We anchored on the southwest side of Tatafa island for three nights, although it was unprotected from the south swell we were getting. That first afternoon, at low tide, I kayaked ashore and took a walk on the sandbar that’s exposed. 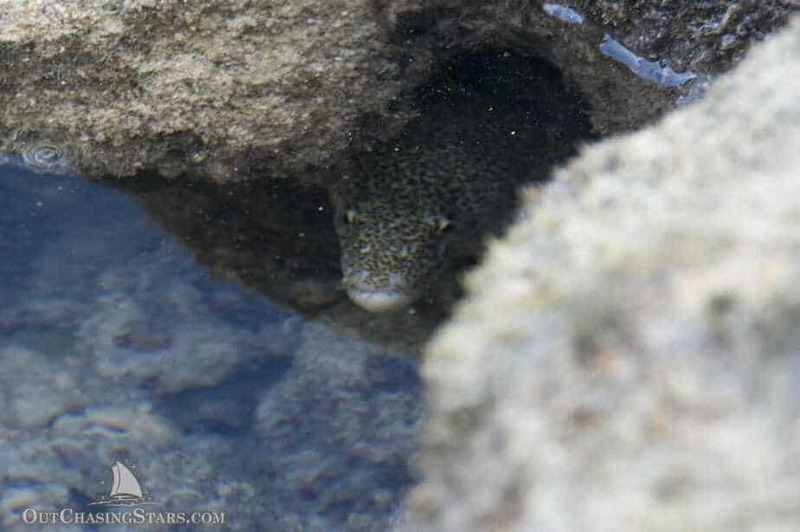 Afterward, I walked along the rocks on the east side and spotted at least half a dozen eels living in the tide pools! 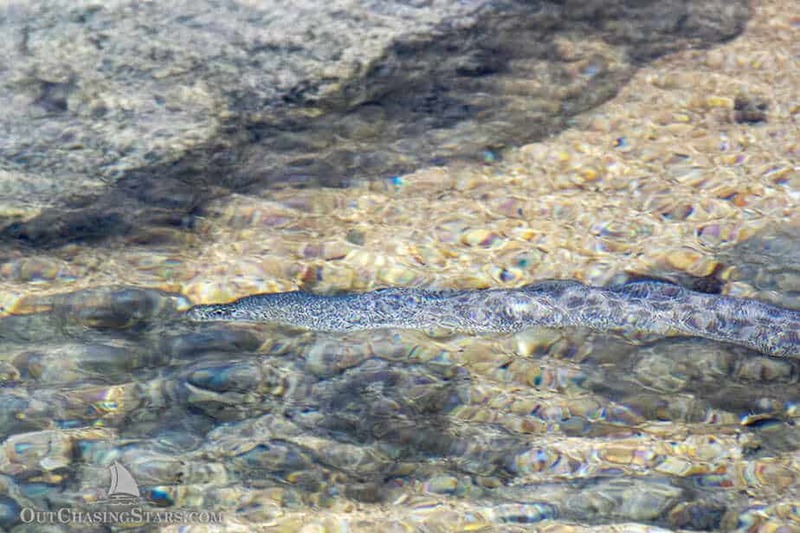 Many of them came fully out of their burrows to swim around in the shallows. Of course, when I came back with my camera they were much shyer. On the west side beach, I found lots of really interesting shells. The beach had a few nearly full sea urchin shells and a few decomposing sea urchins. 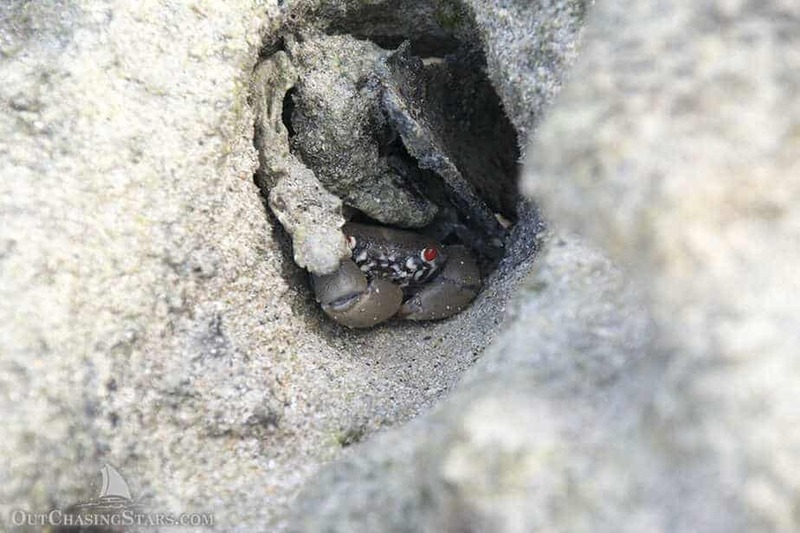 There were three species of sea urchins – the smallest one had a white shell, the middle one had a green shell, and the largest had a purple shell. 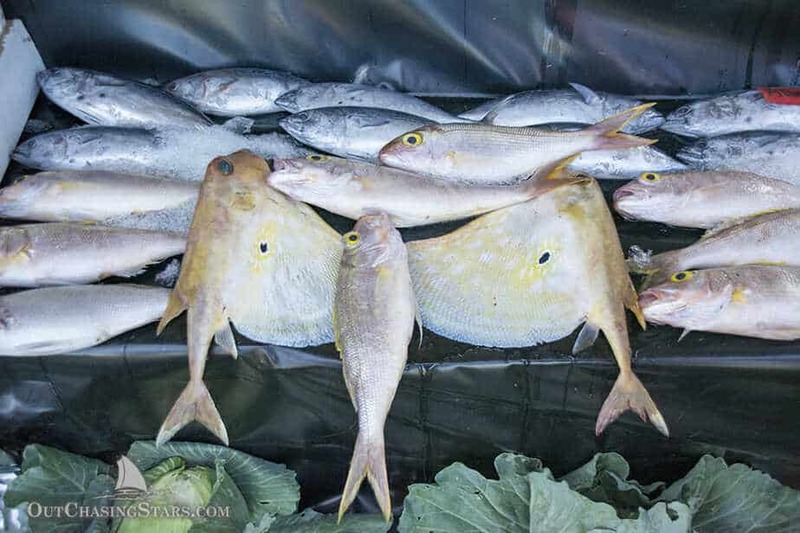 I brought the cleanest green one back (no meat left on the inside) and convinced David to let me wash it off and let it finish rotting on the boat. I also brought a green coconut back, as there are enough small trees for me to reach up and twist one off. Back on SH I chopped off the top and the bottom and drilled a hole for drinking. Afterward, I tried to open it for the meat but I mostly just ended up with fibers in my coconut and pretty much everywhere else on the boat. Next time, I’ll husk the coconut properly onshore. One night, we got a spectacular sunset behind Koa, the dormant volcano. We can’t always see Koa due to humidity in the air, but when we do it’s pretty awesome. The swell was still pretty southerly and we were getting rocked quite a bit, but it’s hard to leave a nice spot where we are all alone. There were at most two sailboats in sight, but they were at least a mile away. A few times a day a local longboat passed by, we think it’s a ferry from Pangai to the main village on Uiha, the large island to the south of Tatafa. It was even harder to leave after our last night, where we fell asleep listening to whalesong through our hulls. On our way to our next stop, we got our spinnaker up! It had been repaired in New Zealand and just bagged up (as most lofts do), so we hoisted it to get the sail straightened, check out the patchwork, and properly furl it for storage. She’s got a few scars. 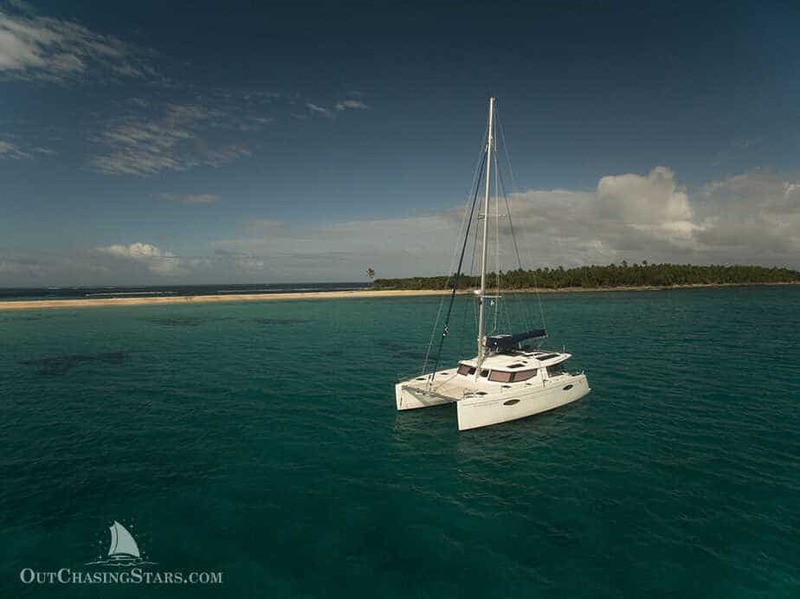 We dropped anchor all alone, just north of the sand bar between Uonukuhahaki and Uonukuhihifo. These two islands are joined by the sand bar even at high tide, so I’m not sure how these can be called two islands instead of one. “Nuku” means island and “uo” is lobster. “Hahaki” means east and “hihifo” means west, so these islands are, in English, East Lobster Island and West Lobster Island. We didn’t see any lobsters. Another boat joined us for a few hours in the afternoon, and I said hi after I snorkeled to check out our anchor and the surrounding coral heads. Our neighbors were Kiwis who’ve been cruising for over 30 years in the South Pacific. Amazingly, we meet a lot of people like this. I could still hear whales singing as I swam, but mostly the noise was blocked out by my own breathing. We could see two cruising boats further down the island group, at least a half a mile away from us. The winds picked up a bit and even shifted a bit from the north, so once again we were unprotected from the swell. Surprisingly, one of the boats dingied over to say hello – John and Wendy from Midnight Sun. 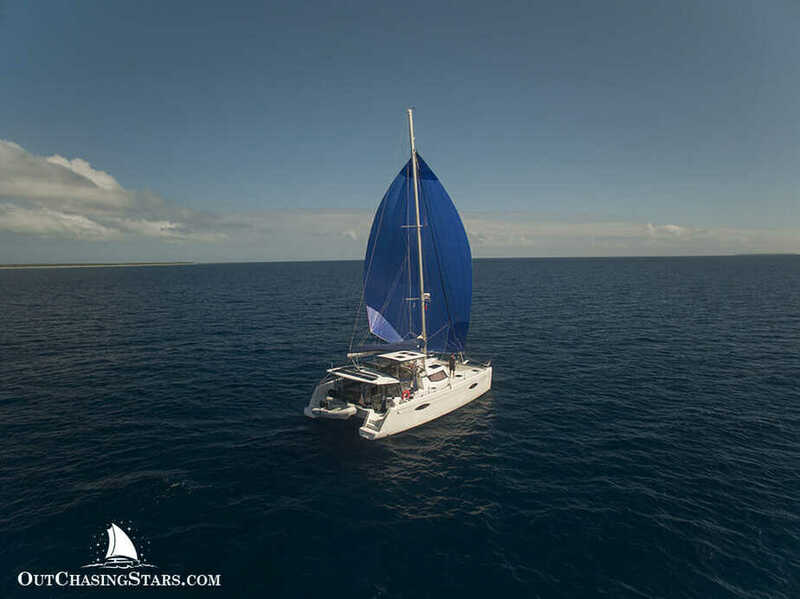 We had a mutual friend in common – Whistler – so we had heard that John and Wendy spend three months of the year on a sailing yacht, boat sitting and doing R&M for the owners over the holidays. 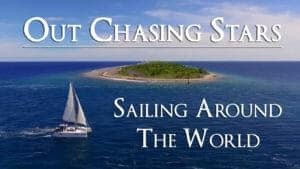 They’ve also built their own cruising boat, and have been sailing the South Pacific for nearly 20 years. It’s not too often that strangers dinghy by to say hello, and we were especially pleased that they dingied so far to say hello. Monday (July 31st) was gloriously sunny again, so I went to shore in Aquila and went for a walk. I picked up all kinds of interesting things – a sand dollar, cuttlebones, and a variety of beautiful and shiny cowries. 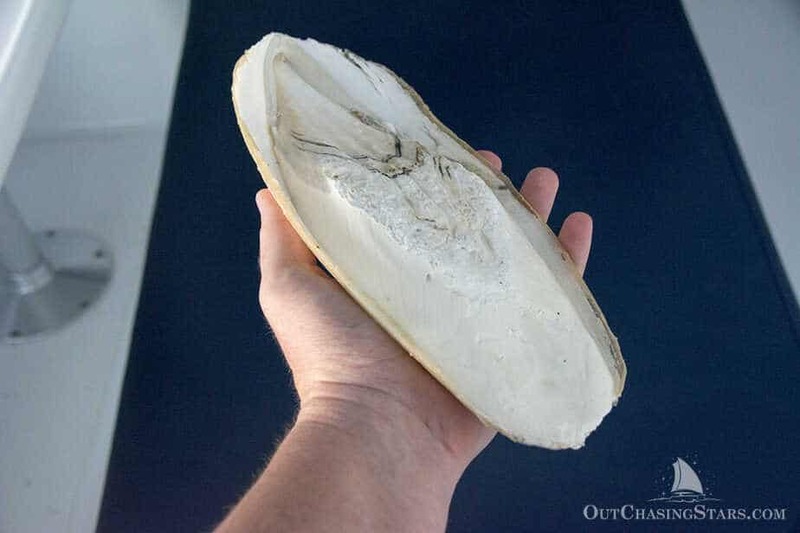 Some of the things I brought back, like a cuttlebone about 10 inches long, to show David. I also brought back a coconut. This time, instead of husking it, I drilled it open. I collected the water to chill and drink later. Delicious! 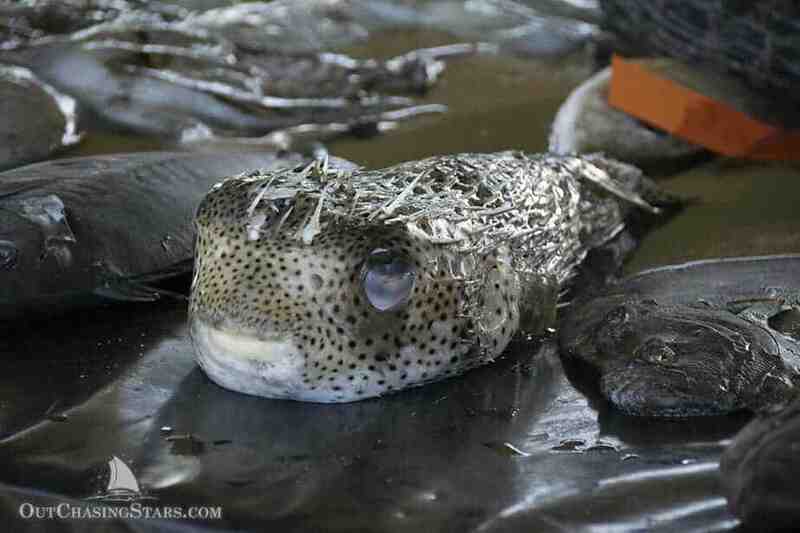 Imagine the size of the cuttlefish! Every day we’ve seen whales off in the distance – spouting, tail slapping, breaching, basically just doing their whale thing. 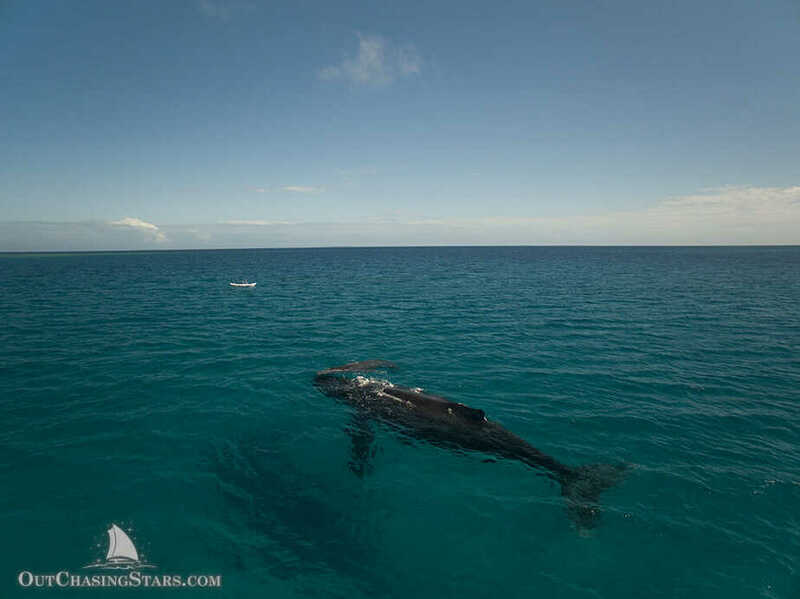 At around 2 pm that day we noticed a whale sitting calmly in the water on the inside of the reef – in the shallow water. We kept an eye on it for a little while and eventually I decided to paddle out in Aquila to check on things. As I approached, I got a special treat; this was a momma whale, who had just given birth to a calf. I kept a careful distance away (I’m not sure if they even noticed me since kayaking is pretty quiet and calves are pretty noisy). The momma whale was holding the baby up in the water, helping it breathe. We don’t know for sure how recently the baby was born, but I can’t imagine it would have been born in the deep waters. 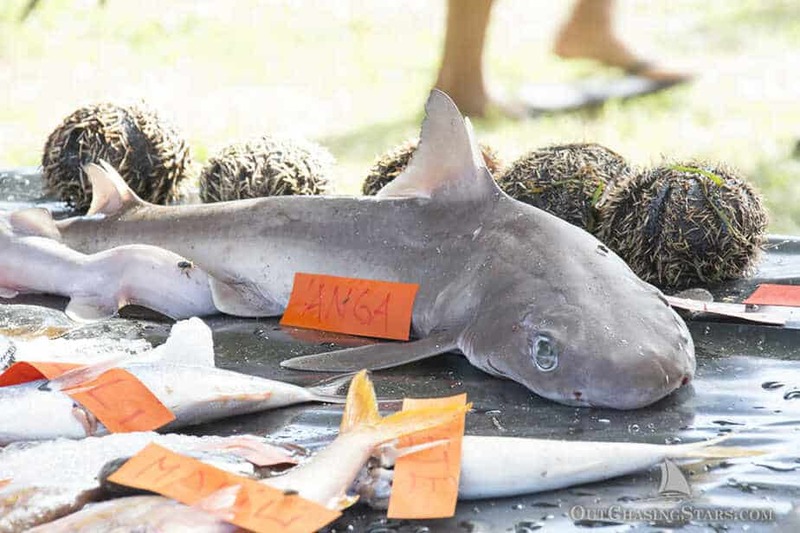 Actually, the baby’s fin was still curled up from its time in the womb and the birth process. I’d say the baby was born within an hour of me getting out there. David flew Phoenix over, and we got a few amazing shots! 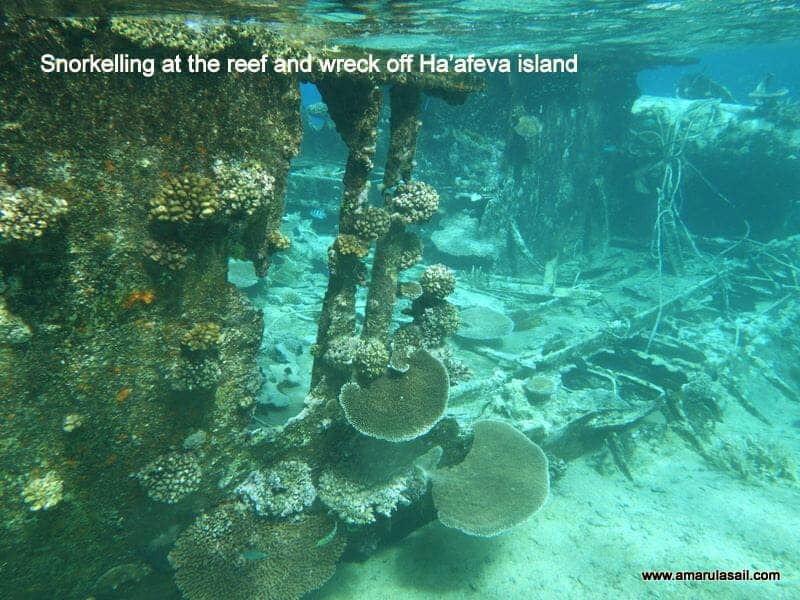 This is one of our big highlights in the Ha’apai our circumnavigation. We knew that Tonga is a big whale birthing grounds in August and September. Friends of ours witnessed some newborn calves last year. However, this is not really a common or well-studied event, and scientists don’t really know much about the birthing of a humpback whale. For us to get to see it is….amazing. Back on SH we watched for the next few hours as the calf and mom moved around. We’d been keeping an eye on the weather and took an opportunity to duck out and head a bit further north. We moved just a half a mile away (where Midnight Sun had been anchored). This spot afforded just slightly better northly protection, but also got us a bit better cell phone signal and strong easterly protection. The forecast for Tuesday, August 1st was that the wind was going to pick up to 20-30 knots from the east. We set our anchor down into a big sandy spot. On the way over, we saw another mother-and-calf pair in the shallows. The next morning, we saw them again, and it was fun to witness the calf getting lessons on how to be a whale. 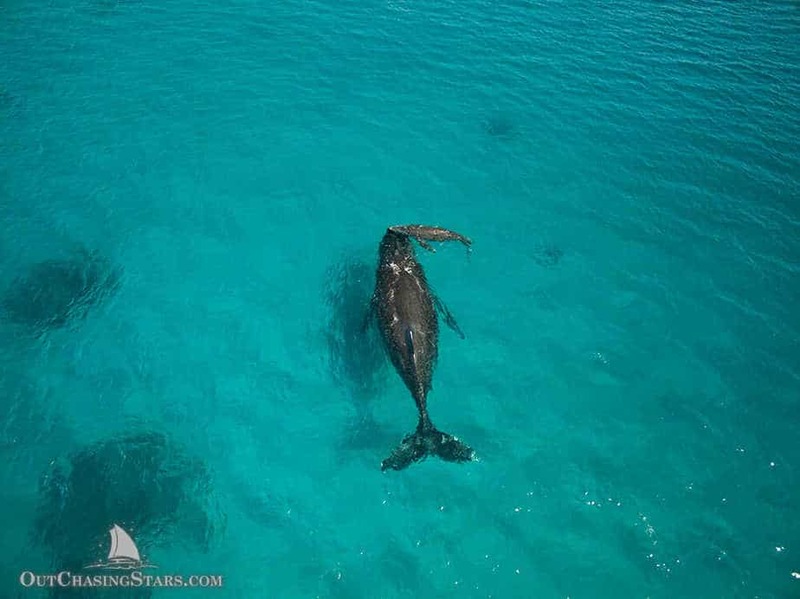 At one point, momma whale was on her side, slapping the water with her fin, her fluke halfway out of the water and the baby calf poking his nose out! Although the day remained sunny, the wind did pick up, so we stayed tucked inside most of the day. At this point, we were running out of fresh food. Next stop, Pangai for some provisioning! 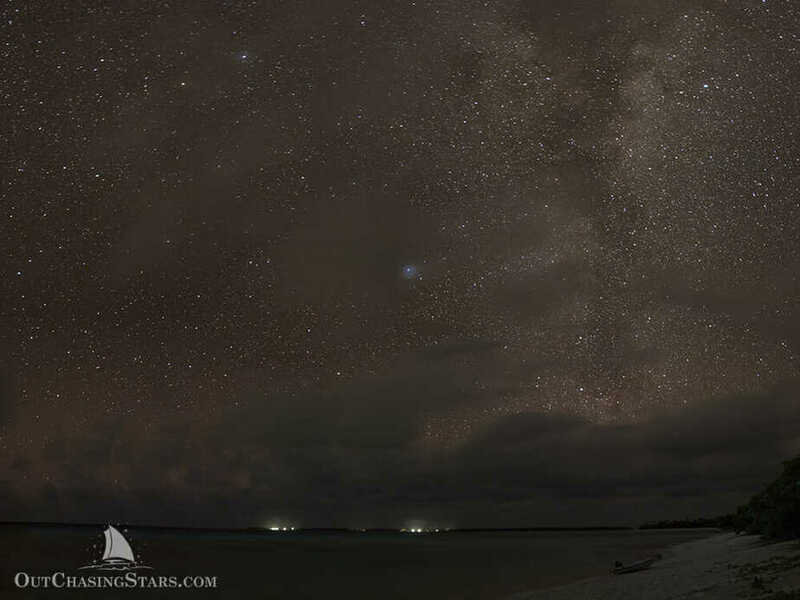 We finally brought Starry Horizons into Pangai, just for a one-night provisioning stop. 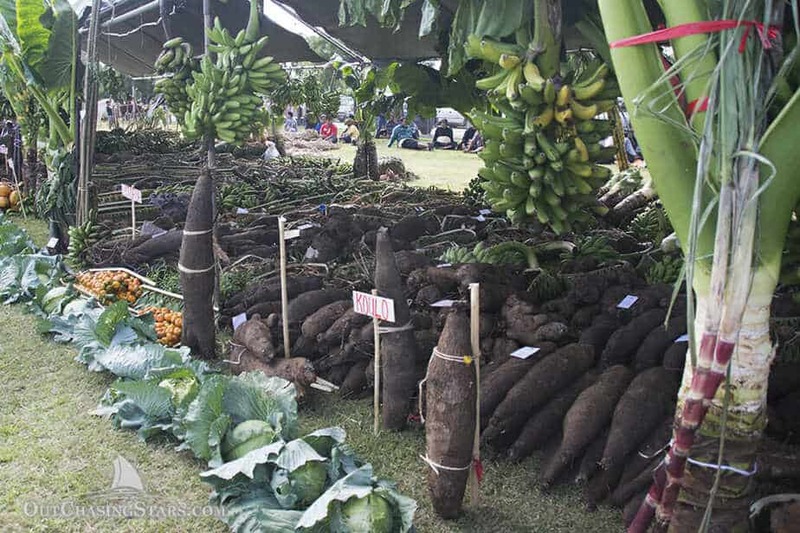 I went to the market and was able to get papayas, bananas, bok choy, cucumbers, cabbage, and carrots. I stopped at the Chinese grocery store to pick up a few nonperishable items, and we were all good! In fact, prices were very cheap and the quality was good. Just when I got back to the boat, the ferry/cargo ship was coming into Pangai. That was interesting to watch, and this ship goes all around Tonga. Our next stop was twenty miles south to Ha’afeva. We even got the spinnaker up for a bit AND Phoenix out! The bow of the boat. Off in the distance you can see the fields of coral. Excellent growth on the wreck itself. And that’s it on our time in the Ha’apai! We absolutely loved it, and as always, wish we had more time. We left Tonga on Monday the 7th and arrived in Fiji three days later. The winds were high and behind us. We aren’t using our mainsail right now (we lost the battens – long story). So sailing with headsails only in 20-30 knots of wind, we came in just under 6 knots average. 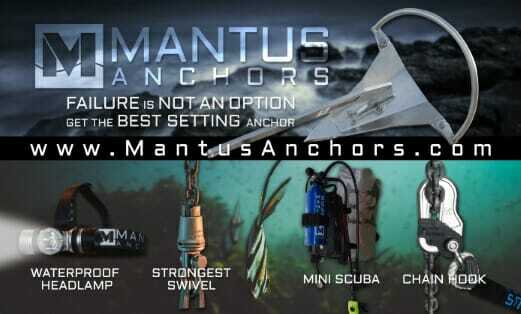 We did a lot of gybing, and used our outboard jib lead all the time. Our screecher got some use for most of the last night. 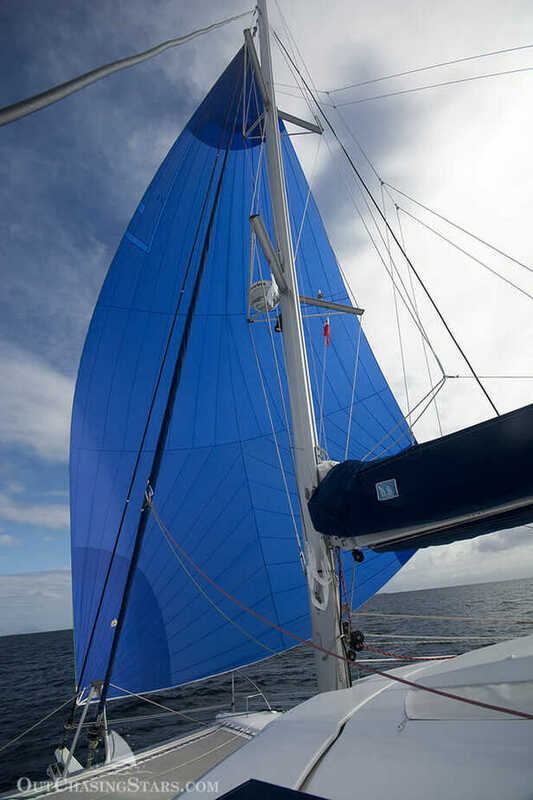 We even popped our spinnaker up a bit approaching Savusavu. Incredible pictures of the stars, Amy – and equally fabulous pictures of the native dancers. Great to read your blog! Glad to be part of your cruising experience! You are a great story teller! Love the photos! Ughhh… the picture of the turtle is so sad☹️. Your photography and travelogue are fabulous!